Let me start by saying our thoughts and prayers are with our hostess Judy of Pursuit of Functional Home. On Tuesday, Typhoon Yolanda was on it's way to the area in which she lives. The news this morning was reporting on some of the destruction and devastation of the storm. I haven't heard from Judy and pray everything in her world is alright. Please whisper a prayer for her and her family. WELCOME TO PIN IT MONDAY HOP #34 Pursuit of Functional Home had some site glitch last week. Some of you was not able to get into the party. Hopefully, the problem won't happen again. Thank you so much for linking-up last week. 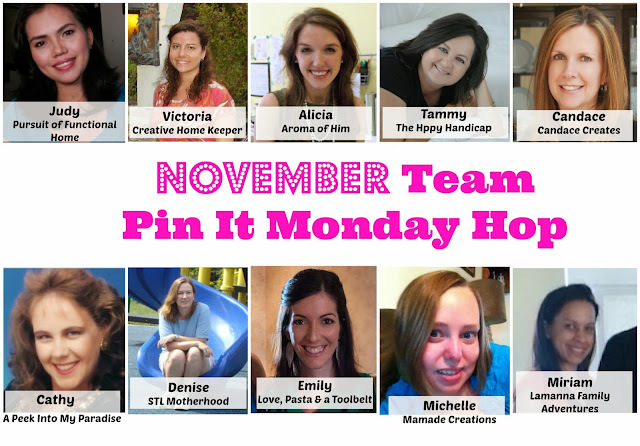 All your posts are pinned at : Pin It Monday Hop Participants. Kindly ensure that you entered a correct post URL and it should have an image for us to pin. Let us get to know our Lovely November Cohosts! Let us meet our November Co-Hosts! At A Peek Into My Paradise I share recipes, DIY, crafts, travel, everything Disney and bits and pieces of life sharing a peek into what makes my life paradise. Plus, I love link parties and giveaways....so there is always something happening at A Peek Into My Paradise. Hi! I'm Alicia, also known as "the Mrs." on my blog. My family and I live as expats in SE Asia. I blog about our life overseas, recipes I attempt to make while substituting lots of ingredients, projects I do around the house, "tot school" lessons I teach to my toddler, and lessons I learn through parenting and walking with the Lord. Michelle is a single mom to an amazing 2 year old boy named Eli. Michelle blogs at The MaMade Diaries about crafting, blogging and everyday mommy life. I'm Emily and I blog over at Love, Pasta and a Tool Belt. I blog about new recipes we try, DIY crafts, home decor and improvement projects. We just bought a new home and are remodeling it so head on over and follow us for all the great posts we will be sharing about our house remodeling adventure! Wife and Mom of two adult daughters. Expecting my 1st grandchild in November 2013. I live to have fun and be happy whilst outwitting a disability. I'm a stay at home mom with 2 kids my son is 3 and my daughter is 10. I enjoy doing DIY projects and sharing them with everyone. I'm also in the middle of taking online courses to became a Real Estate Agent. Hey there! I'm Victoria from Creative Home Keeper. I'm a Jesus girl, wife to my best friend, mommy to two precious little ones, lover of words, avid reader and aspiring home chef. One of my goals on my blog is to encourage you to live more simply, intentional, and inspired at home. I'm so excited to be here and look forward to sharing some of my journey. Blessings to you! Hi, I'm Candace and I started CandaceCreates.com a few months ago to share my love of crafts, life, faith, and writing. I am a wife, stay-at-home mom to 2 kids, and blogger hoping to help others find inspiration and assistance with life and creative endeavors. I have just finished a 31 day series on food issues, including tips, support, and a clean-eating food plan for living a healthier lifestyle. Denise blogs about crafts and fun things to do in her hometown of St. Louis, MO at stlMotherhood.com. She is freelance reporter and at-home mom of two boys, 14 and 6. 10 Blog Sites: Yes! Bigger and wider reach. Your post will be seen at 10 lovely and awesome Blog sites. Enter your Pinterest Profile URL (www.pinterest.com/PROFILE URL) Please check your Profile Name below, if it exist then you do not need to re-enter it again.